Rodin’s The Age of Bronze was the inspiration for my entry into this year’s V&A Inspired By.. competition. Last November I visited the sculpture gallery in the V&A and sketched Rodin’s masterpiece over a number of days. Some time later I discovered that the V&A ran an annual competition to create an artwork inspired by something on display in the museum. The Age of Bronze was also known as The Vanquished, about a soldier defeated in battle. My interpretation would be of a British soldier in Afghanistan who had just returned from patrol and was in despair at the loss of his best friend to an IED. I wanted my model to be black to echo the blackness of the bronze sculpture and found Sebastian who had a perfectly toned body. He sat for about 8 sessions, each of about 3 hours. The pose was extremely difficult and he could only hold it for about 5 minutes at a time because of the stress on the back of his neck. So it was a particular challenge for both of us. A produced a number of preliminary drawings before deciding on the pose and the lighting. 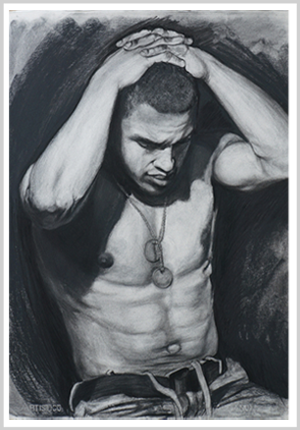 The plan was to work in charcoal for the final drawing as it reflected the blackness of both sculpture and model. it seemed to take an age to complete and then I submitted a digital image online, as most competitions now request. Some weeks later I heard that it had been accepted for exhibition and that all exhibitors were eligible for a prize in one of the 11 categories. These would be announced at the Private View, held at the Morley College and Gallery, near Waterloo on Monday 19th May. I was pretty chuffed to be in the exhibition, but I fell off my perch when my name was read out to say that I’d won the Drawing and Painting prize. It was great to have one’s work recognised, and it made the struggle worthwhile. The certificate signed by Gill Saunders, Senior Curator at the V&A was an added bonus, just like the £50 prize money which went towards paying the £65 fine I incurred when I forgot to pay the Congestion Charge the day I delivered the drawing. But hey, one doesn’t win an art prize that often and I reaaaaally enjoyed my 5 minutes of fame.